Daniel Lopatin, better known to internet based fandoms as Oneohtrix Point Never, is an innovative and forward thinking producer. 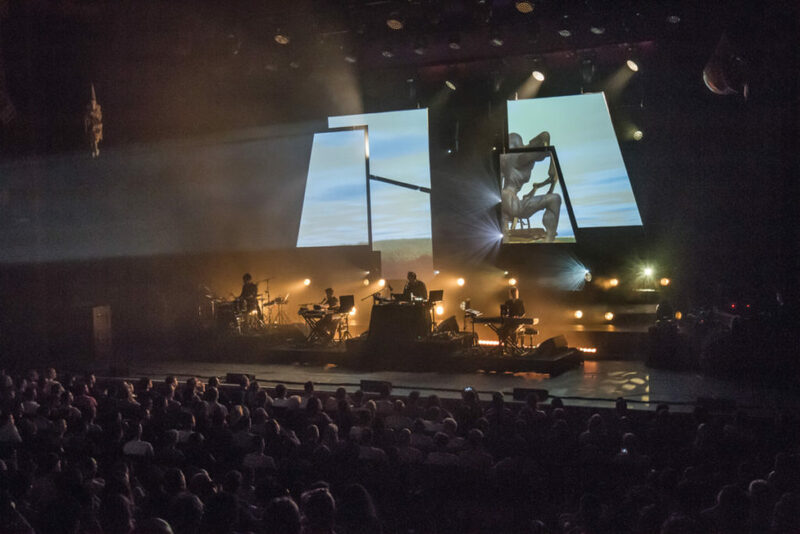 In his recent string of shows he has extrapolated the themes and aesthetics of his latest LP “Age Of” through multiple visual disciplines and collaboration. What results is MYRIAD, a live performance exposing a world that’s equal parts mystical, esoteric and technological. MYRIAD recently took place in the Barbican Centre in front of a full house. Having premiered in New York’s Park Avenue Armory, this set of performances are the first in which Daniel Lopatin played as one part of a quartet instead of going solo. Joining him were previous collaborators Kelly Moran playing many of the synth and harpsichord sounds, Aaron David Ross supplying extra keys, vocal synths and foley triggers which combine and counter David’s output, and Eli Keszler thriving in a suitably unhinged percussion role. A heady trip through humanity in all its consequences fills MYRIAD to the brim. Going into it, one doesn’t know what to expect; previews for the event come with quite dazzling descriptions of the multiple artistic mediums that make up the concertscape and reference the specific concept fuelling the production: a highly evolved alien species desires to bequeath the simple consciousness of the human race unto itself by uploading something like the ‘tl;dr’ of human history through all its’ available media. The way Daniel describes the concept, it sounds almost like the evolved species getting an opiate-like high from dreaming of us. In effect, this POV approach turns the audience into the aliens themselves. We behold and consider the stretches of our recorded media from across the internet in a flurry of computer generated imagery. The architect Griffen Frazen helped with the stage design, using a layout that brings a balance between symmetry and asymmetry. All the images are presented on a screen which itself is composed of 5 smaller geometric fragments, allowing easily obfuscation of the imagery displayed on them. Deliberate stage lighting schemes enhance and compliment the other visual mediums present. The screens are separated to reveal gap in between their 3-2 split, through which a bright yellow shines with sacred purpose. These lights around the stage act as back lights, spotlights and more as they carefully work to guide our focus in a timely fashion with movements and moments in each piece. This dreamlike “quasi-opera” unfolds in four chapters, each separated by the most obscure moments of the show – a light shines onto a sculpture, a tortured and warped looking figure hanging from the ceiling above the left corner of the stage in the first two chapters, then onto one on the right for the next two. During these transitions are voices modulated to such an extent and forced down so low in pitch that they are indecipherable until their last seconds where some words start to become slightly comprehensible, but it’s hard to make heads or tails before we enter the next phase of music. In the use of four aeons, as well as in terms of it’s ensemble dynamic and musical course, MYRIAD builds on the expression, structure and production found in it’s companion record, “Age Of”. Lopatin has previously described his music as “compressionism”, taking sources across the expanses of the internet, in all its archived history, accommodation of futurism and endless cultural offshoots as reference points. These are digested into abstract, uncanny and chaotic pieces of music that delight the listener by warping the ear’s comprehension through its runtime. In “Age Of”, he processes these ideas in a weave of near-disquieting forms, following in approach how the heady contents of his previous works have been stitched together. When talking about “Age Of” in an interview for Red Bull Radio, Oneohtrix Point Never explains the title’s lack of definition being wholly relevant to our misunderstanding of history. The internet of ideas and the filter of understanding our past (which we call recorded history) make up the gauntlet of imagery displayed on the screens above the stage. In the same interview he talks about François Rabelais who played a significant influence on the thought and artwork surrounding MYRIAD. In one of Rabelais’s stories, two hedonistic giants try to understand the universe through “interacting with everything and everyone, and consuming everything and everyone”, relating back to all of us sitting in the room. We are taking so much in but instead of becoming enlightened from consuming more than anyone could make use of, we fall into the decadent loitering of the alien race that’s observing human media, in all it’s obfuscation of truth. Something that may be familiar to anyone who has spent much time-consuming ideas through the internet. For such conceptual depth, there is still space to not think or meditate and just behold. Relief from a constantly viscous intention allows the elements of sound to move the audience on it’s own accord. These elements are thick with complexity and fluidity. The accompaniment of musicians on stage accommodate this freeness that Oneohtrix demands. 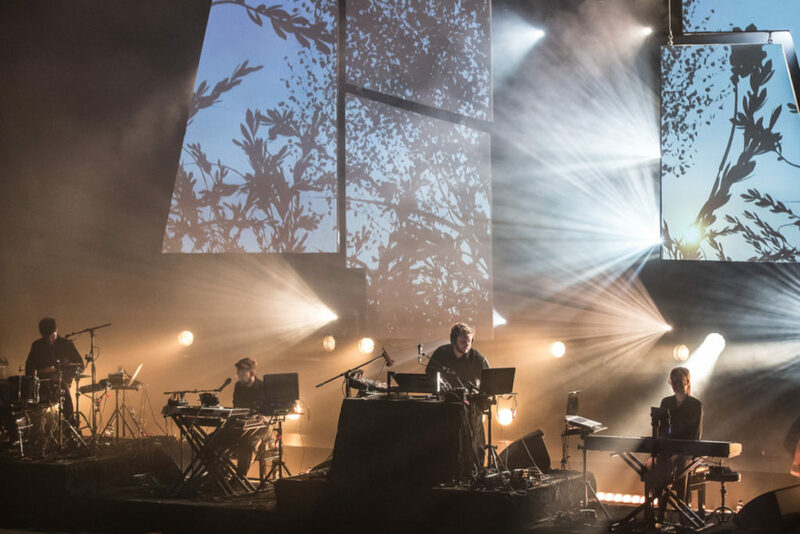 The use of the drums, acoustic and triggered percussion was flexible as a rag doll, the human element stretched beyond its usual habit of form in order to coalesce with the disorder and aleatoric movements of Oneohtrix’s electronic and synthetic sounds. The warped sounds from MYRIAD compliment the warped, fluctuating perspective of the audience so idiomatically. Kelly Moran injects the rest of human history with the use of harpsichord and string-like inputs while both Daniel and Aaron Ross express our future trajectory through all sorts of unimaginable sound, gaping and flurried, resulting in artificial-turned-biological oceans of sound. It’s theatrical and big, almost pushing to become overwhelming at times. The lighting sometimes breaches the limit of the stage, flashing on the sides of the room or dotting across the audience. This doesn’t impede on the ensembles’ ability to change pace. Often times the subdued nature in “Age Of” takes charge in creating space, the musicians have opportunities to lead and flex their own talents. Despite everything there is to take in, the music is still centre of everything. The sound is clear and full. Not one aspect of MYRIAD’s soundscape is under-represented by the sound system in Barbican’s concert hall. The track “Age Of” opens the whirling world of intrigue, “Black Snow” is accompanied by a set of leotard dressed, dancing cowgirls. It’s a strange combination of an unusual music and contemporary choreography. “Same” and “We’ll Take It” are both explosive, the former extremely affecting in it’s strong vocals originally recorded by collaborator Anohni. “Toys 2” and “Babylon” are both relaxing, the former providing further intrigue somewhere within the mid-point and the latter bringing a lonely introspection near the shows end. After all is said and done, an encore and two standing ovations later, the audience filter out of the concert hall and onto the opening by the lakes and fountains in Barbican’s unusual, retro-modernist garden. Unlike most venues which necessitate fans to spill out haphazardly onto a street while figuring out in which direction to meander, the Barbican Centre provides this unique and visually intriguing courtyard for everyone to wind down, converse and debrief themselves, which is something a little more dignifying and appreciated after about 70-80 minutes being reminded how little we understand ourselves, or anything.